Elevated between 4265 ft and 9222 ft, the Ski Resort is among the 15 highest elevated Ski Resorts in Austria. The vertical drop from summit to base is 4957 ft. The average difference in altitude between base and summit of Ski Resorts in Austria is 2392 ft. Most runs are therefore relatively long. 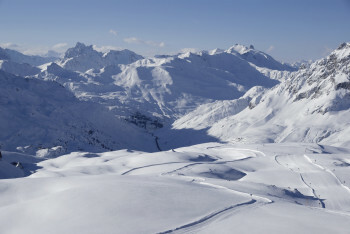 Lech Zürs (Ski Arlberg) is the the best rated ski resort in Austria. It is among the 10 most family-friendly ski Resorts in Austria. Average snow depth during the season (Nov 30 to Apr 28) is 67 " at summit elevation and 41 " at base elevation. Snow coverage is usually best during March, offering an average snow depth of 94 " at summit elevation and 54 " at the base. Therefore Lech Zürs (Ski Arlberg) is among the 15 ski Resorts with best snow conditions in Austria. 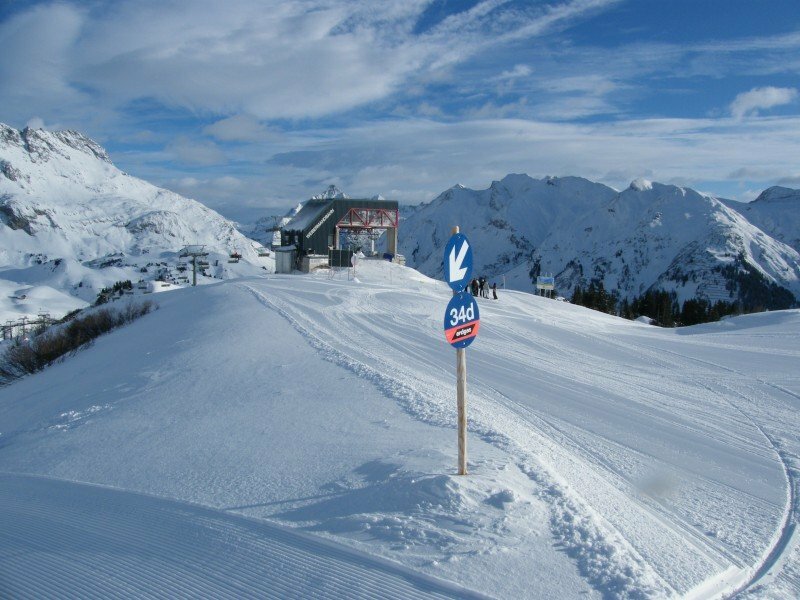 Lech Zürs (Ski Arlberg) features 69 sunny days on average per season. 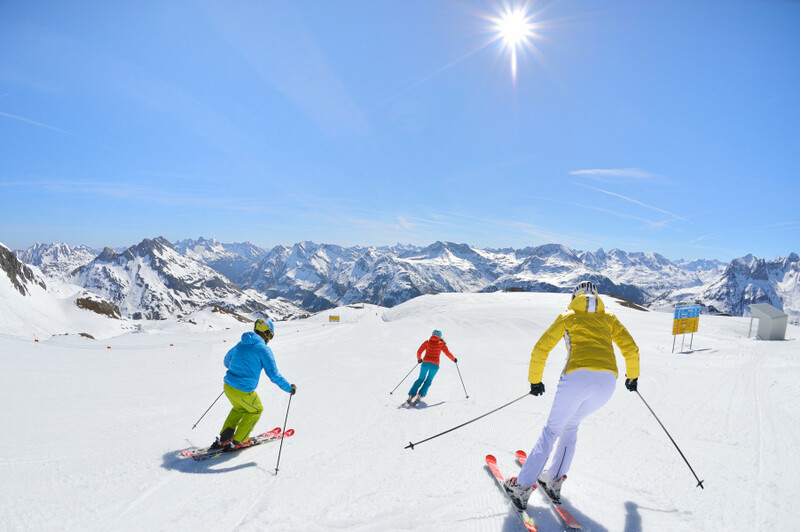 The average for all ski Resorts in Austria is 64 sunny days. April is the sunniest month with an average of 22 sunny days. 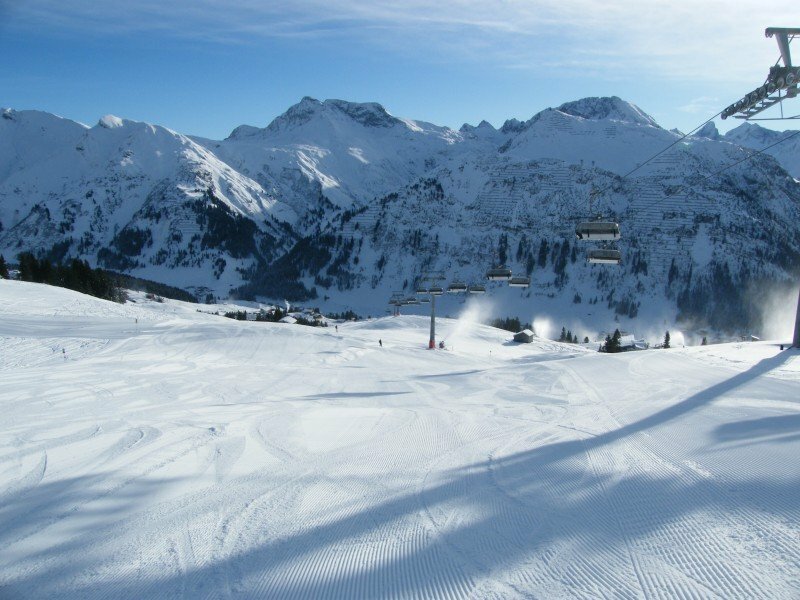 Offering 190 miles of slopes and terrain, Lech Zürs (Ski Arlberg) is among the 3 largest Ski Resorts in Austria. 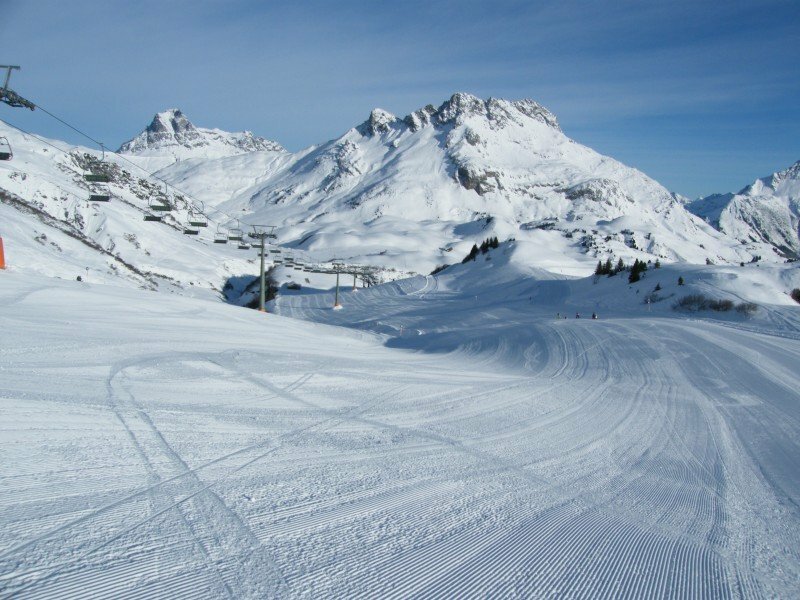 The Arlberg was the pioneer alpine ski resort to employ a ski tow in Austria during the 1930s meaning it´s rich in tradition and history. Don´t expect an outdated ski resort. 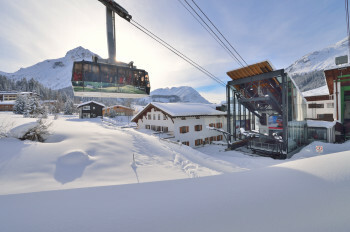 Top-modern lifts and new investments made it to a top modern ski resort where you couldn´t ask for more. It joined together with Warth Schröcken in the season of 2013/2014 and is now the largest ski resort in Voralberg. It features incredible 190 kilometers (118 miles) of ski trails. The association Ski Arlberg that includes St. Anton am Arlberg, Stuben and Sonnenkopf even holds the title ´best ski resort in the world´. Descent areas in form of blue runs are everywhere in Lech and Zürs and welcome all beginners and athletes re-entering the skiing world. Most of them bring you right back to the base. All newbies should definitely check out Berger-Rinderalpe to find some easy runs that all take you to Lech. 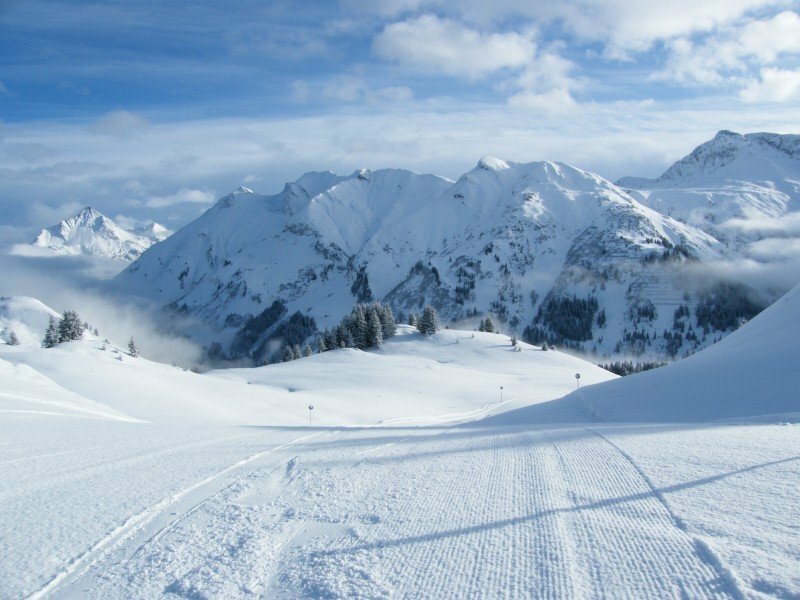 Hexenboden, located on the Zürs site, has some amazing blue and red runs and is therefore an other hot spot for all beginners and intermediate skiers and boarders. All those who already have gained more experience in the winter sport scene, can enjoy the ski circuit ´The white ring´. Follow the circuit clock-wise through the resort to really enjoy every part of Lech Zürs while conquering 5.500 height meters ( 18.044 ft) and 22 kilometers (13,6 miles) of trails. ´The white ring´ became famous through the eponymous race where professionals and amateurs compete against each other. That´s not the only time the circuit is open, you can hit it as long as the season lasts. Start by grabbing Rüfikopf tram up to the summit. Take a second and enjoy the breathtaking view before you hit the surrounding trails. By skiing down Schüttboden run you will pass Hexenboden and get to Zürs. The other mountain side boasts lake Zürsersee and Madloch-Joch, by the way the highest point in the resort by featuring 2.444 height meters (7.362 ft). The run to Zug starts at Kriegerhorn and is the last run of the circuit. Follow four kilometers (2,5 miles) in order to get back to Lech. An other option: Head in the direction of Weibermahd lift and grab Auenfeldjet gondola to access ski resort Warth Schröcken. The ski circuit is not the only choice for expert skiers. Sonnenbergabfahrt (15a) is oriented to needs of skiers that love to challenge themselves. However, there are more ski circuits that will even please the most courageous skier and snowboarder. For example the race slopes at Hinterwies lift, baby lift Zürs and speed check next to Weibermahd lift are the spots to prove your skills. All freestylers find excellent features that will give an adrenaline rush in the terrain park Lech at Schlegelkopf. It ranges up to 1600 meters (5.249 ft) and offers about 20 obstacles to bring each rider to its maximum. This 3.6 ha big park challenges skiers and riders of every ability by featuring an area for beginners, a rail-line for intermediate freestylers and a kicker-line for real experts. Experience Heliskiing in Lech Zürs. That´s a one of a kind skiing experience in Austria! Get in the helicopter and choose between the locations Schneetal-Orgelscharte or Mehlsack, the perfect spots for experienced winter athletes. The panorama restaurant Rüfikopf serves Austrian specialties and hearty fare and also has an amazing sun deck. Guests will enjoy the fantastic meals here at an altitude of 2.350 meters (7.709 ft) above sea level. Balmalp at lift Zugerberg on the other hand appeals with its healthier menu featuring crispy salads and wok dishes. You need more coziness? 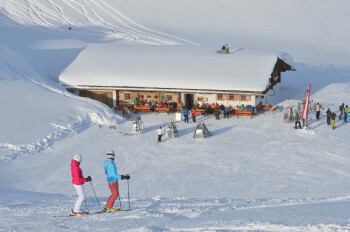 The 400 year old Schröfli Alm is your spot to take a break in a comfortable environment. You will see it just as you leave the Sonnenberg slope. Seekopf restaurant is perfect if you only need a snack and want to save your calories for dinner. Experience the longest trail in the resort with its 5,5 km (3,4 miles) that descends right into the valley. Go and explore the beautiful winter landscape on the hiking trails. 16 well-groomed trails are available and come to a total of 40 kilometers (24 miles). Hands down, the high-altitude hiking trail Gaisbühel is definitely one of the highlights and gives you four kilometers (2,5 miles) of pure hiking enjoyment. Feel the fill of the thrill while winding down the 1,2 kilometer (0,74 miles) long toboggan run from Oberlech to Lech. In those kilometers you´ll make your way through the dreamy forest Burgwald. The Oberlech gondola gives you a ride to the starting point and you can actually go tobogganing until 10 pm. Good news for night owls that need an action-packed night! If you are an ice-skating fan, go and check out the natural ice rink in Zürs or the covered ice rink in Lech, right next to Hotel Monzabon. A great opportunity for lovers of contemporary art is a visit to Skyspace Lech. US-artist James Turrell has created a stunning installation of light and colour for visitors to enjoy an extraordinary view of the sky. The Apres-ski ambiance is overwhelming by giving the right answer to everyone´s taste. The Frozen Icebar at Schlegelkopf provides a great terrace with outside bar that leaves no drink request undesired. Not so fancy but same fun factor offers Kriegeralpe, located at the chairlift Hasensprung that almost spreads homely comfort. A big selection of drinks and great music puts everyone in a good mood at Rud Alpe. The town´s highlights are Pfefferkörndl and Archiv Bar where party people dance until literally the crack of dawn. Lech Zürs is well-known among gourmets from all over the world. You find the most touquet awarded restaurants in Austria. Griggeler Stuba for example: It already owns three touquets and is one of the most popular fine dining restaurants. Guests who are dining will enjoy light dishes prepared with only local and fresh products. The wine list is almost as unique as the food you get here. The Post specializes in gourmet fish specialties while Brunnenhofs menu has mostly vegetarian, gluten-free and lactose-free food on the menu. If you´re up for fondue, definitely pay Arlberg a visit at your leisure. Zürs welcomes with ´Die Ente in Zürs´ that takes pride in its wide variety of duck dishes. The town also welcomes with Thurnhers Alpenhof that impresses with a big sun deck from where visitors enjoy Austrian food with international influence and the breathtaking view of surrounding mountains. Coming from the West take A14 to Bludenz and continue on S16 where you exit at Langen. Now change to Flexenpass and follow in order to get to Zürs and Lech. Coming from the East take Inntalautobahn (A12) via Innsbuck and Landeck to St. Anton at Arlberg. Make a turn onto Flexenpass and follow for Zürs and Lech. Coming by train your end stations will be Langen at Arlberg or St. Anton at Arlberg. Both train stations offer bus connections to Lech Zürs. You can always take a cab to the ski resort as well. The next airports are Altenrhein (100km away), Innsbruck (110 km) and Friedrichshafen (130 km). During the winter season you can use the shuttle bus from Zürich airport (200 km away) from Friday to Sunday. Lech is the best ever!! this ski area is really the best, perfect snow and great altitude.Febuary 2007 was a bad year because of lack of snow but 2008 sounds to be very promising.... I am staying in Zug because its nice and quiet and it has a lift to merge with the rest of the network! !Great !! 5 stars ! !